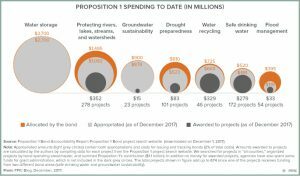 The most recent 2014 Proposition 1 water bond funding has not even been fully spent, and will not be spent by the end of 2018, according to the Public Policy Institute of California. Some hasn’t even been appropriated. Thus far, Sites Project Authority is promised nearly $1 billion from Proposition 1, while Temperance Flats Reservoir Project received appropriations of only $171 million despite having virtually identical “public benefits” scores. In fact, very little has been spent at all for water storage projects that would create new water-supply sources for Californians, which is what the state actually needs in order to realistically deal with inevitable droughts. It’s a chronic problem of voters’ expectations being delayed and deferred without action. Proposition 84 and Prop 1E from 2006 still have money left, according to the PPIC. Given that the state still hasn’t spent that or additional sums from the $7.5 billion cache in the Proposition 1 water bond passed in 2014, why are there yet two more so-called water bonds on the upcoming ballots? The oft-repeated media fib that farmers use 80 percent of California’s water, is not true. California uses 40 percent of the water from the Tuolumne, Stanislaus and Merced rivers, for “endangered fish.” Across the entire state over a 13-year period from 1998 to 2010, only 41.4% of all the developed water supply of California flowed to farmers’ fields and livestock. In that same time period, the state used 47.5% of its developed water supply for the environment, including wild river flows, managed wetlands and wildlife preserves, habitat and water quality control for fish, and required Delta outflows, according to the Department of Water Resource. 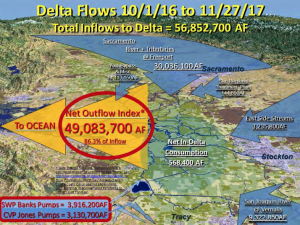 Water is diverted in times of drought and times of plenty to the Sacramento-San Joaquin Delta, leaving much less for irrigation or for Californians to drink. The state of California hasn’t significantly invested in water storage since the 1970s when Jerry Brown was governor the first time around. “This is an era of limits and we all had better get used to it,” Brown said upon being elected governor in 1975, embracing the “small is beautiful” way of thinking. Since then, California’s population has doubled, as have environmental demands. 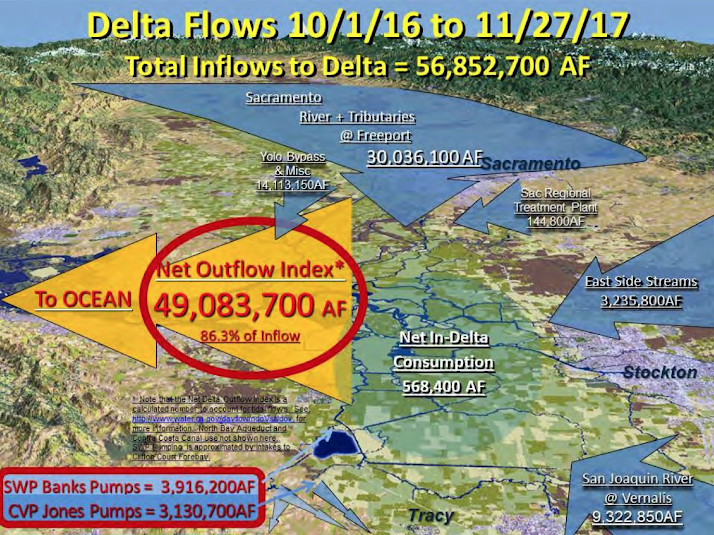 From October 1, 2016 to November 27, 2017, of the 56 million acre-feet that entered the Delta, 49 million in outflows passed through the Delta, San Francisco Bay and into the Pacific Ocean, says DWR. That’s more than four parts out of five that the state mismanaged because of its inadequate water infrastructure. Water wars are historic undertakings in California. While recent winter and spring rain has helped greatly, state water officials now tell us annually that it’s just not enough. Who is Behind the Water Bonds? California Water Foundation, California Waterfowl Association, Natural Heritage Institute, The Nature Conservancy, Trout Unlimited, Audubon California, Ducks Unlimited, Natural Resources Defense Council, Friends of the River, California Sportfishing Protection Alliance, … all have connections to the Resources Legacy Fund, its related tax-exempt foundation Resources Legacy Fund Foundation, and for-profit legal services firm Resources Law Group, founded by Michael Mantell, President of the Resources Legacy Fund and Resources Law Group. Mantell was Undersecretary for Resources for the State of California, 1991 – 1997. Numerous attorneys from the for-profit Resources Law Group also are staff for the non-profit Resources Legacy Fund. The author of the November ballot’s Water Supply and Water Quality Bond is the same Gerald “Jerry” Meral, a longtime Brown Administration official, and highly controversial Natural Resources Deputy Secretary who famously claimed, “the Delta cannot be saved” in April 2013. Meral directed the Bay Delta Conservation Plan (BDCP) for Gov. Jerry Brown to build the peripheral Delta tunnels. Meral left the state to head up the Natural Heritage Institute as Director of the California Water Program. Meral’s fingerprints were all over the language of the 2014 Proposition 1. Meral conceived and was a long time cheerleader for the peripheral canal, despite Voters rejecting Gov. Brown’s 1982 plan to build the Canal through the Delta. Safe drinking water and wastewater treatment for disadvantaged communities. $750 million. San Francisco Bay Wetlands and flood improvements. $200 million. Watershed Improvement $2,355 million to a wide variety of state agencies. The usual suspects are endorsing Meral’s water bond – the same enviro-sounding non-profits claiming to be for waterfowl, ducks, trout, fish, nature, natural resources, and the environment. “The Legislative Analyst’s Office estimates that repaying the $4.1 billion in bonds offered up by Prop. 68 will cost the state $200 million every year for 40 years. What’s certain is that, of the $13 billion borrowed — at an eventual cost to our state’s taxpayers, and their children and grandchildren – $25.4 billion — there’s no money in either bond measure to fix California’s deficient and decrepit water infrastructure or to provide new water to fix California’s chronic water shortage. correction: The California Water Foundation is a project (not an independent entity) of Resources Legacy Fund, while the California Water Education Foundation is an independent 501(c)(3) entity. This entry was posted on Wednesday, May 30th, 2018 at 1:03 am and is filed under Blog Posts.